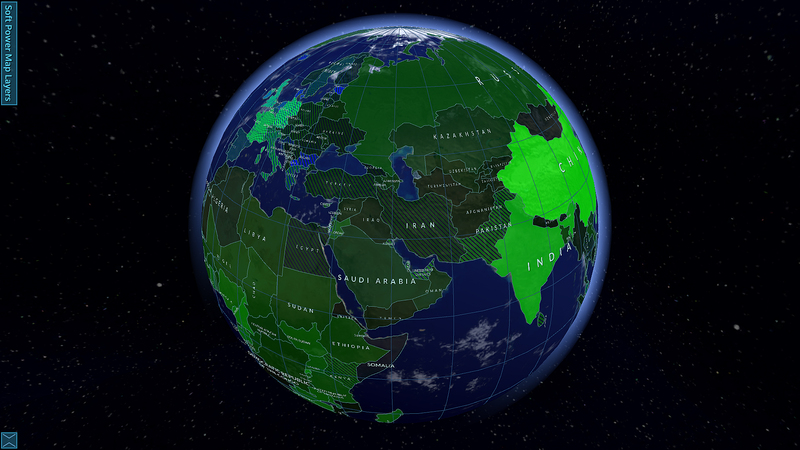 The Museum Soft Power map, an online tool that maps and assesses the ACMI’s “attraction power” in Melbourne and around the globe. Museums are rapidly transforming from cultural heritage institutions into key actors of the creative economy and new centres of soft power: the ability to influence behavior through persuasion rather than coercion. Though museums have strong economic and social impacts in their home cities and towns, there is no clear understanding yet of how to define or measure this power. There is also a growing need to understand how to assess these broader social and economic impacts, to better inform their part in ongoing urban development. To address these questions, Dr Natalia Grincheva, a Research Fellow of the Research Unit in Public Cultures at the University of Melbourne, collaborated with the Australian Centre for the Moving Image (ACMI) to develop the Museum Soft Power map, an online tool that maps and assesses the ACMI’s “attraction power” in Melbourne and abroad. The Museum Soft Power Map offers multilayered exploration of ACMI’s cultural resources, to reveal socio-demographic, cultural and economic factors that affect its capacity to attract larger visitation and revenue from different locations around the world. One of the key layers of the multilayered soft power mapping system is the Melbourne Engagement Power Layer. This layer allows exploration of ACMI’s attraction power to local audiences in Melbourne. It draws on ticket sales data provided by ACMI over 6 years (including residential locations of visitors) together with ABS Census data, to create profiles of the local communities of ACMI visitors. These data include socio-demographic and immigration statistics, cultural, linguistic and religious diversity data, family and household information, professional affiliations and income data. This creates a rich understanding of the patronage of the museum and can reveal more about the Museum soft power in a local context. 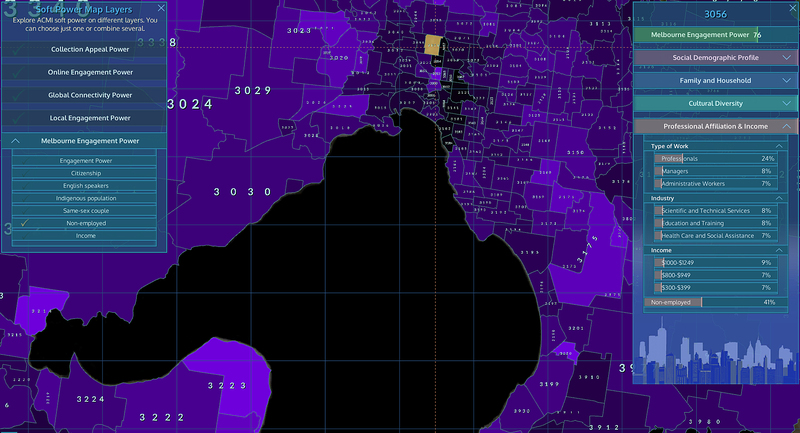 Soft Power Map – Melbourne Engagement Layer depicting levels of museum patronage and non-employment. During this research, AURIN was found to be a truly unique and valuable platform. Australia was the only country that provided the kind of research support that this project relied on. Without AURIN, the depth and comprehension of the Melbourne Engagement Power Layer and the insight it reveals would not have been possible. AURIN provided substantial support for the development of the project, especially in relation to the Melbourne Engagement Power Layer of the museum soft power mapping system. ACMI has an established presence in 16 cities across 5 continents through its international programming and collaborative projects. The data collection and aggregation stage of the research proved to be the most challenging in terms of collecting reliable and consistent census data from these different countries. AURINs data preparation and interoperability standards allows Australian Bureau of Statistics census data to comprehensively integrate in the development of this research. Support and advice from AURIN on the intricacies of statistical geographic hierarchies, naming conventions and how to work with data across different disciplines allowed the researcher to organise and understand their data better. The result was the ability to accurately map where ACMI visitors live and link this information to other demographic data. This gives a richer understanding of not only where visitors are from but also who they are. Soft Power Map – Melbourne Engagement Layer depicting levels of museum patronage and engagement power. This research makes a significant contribution to the study of contemporary museums and facilitates a more contextual exploration of their impacts that can supply further data for a more complex city-wide cultural research and planning. The project also pushed boundaries in the emerging field of digital humanities. The project received the 2018 Digital Humanities Australasia Award, 2018 Award of the International Alliance of Digital Humanities Organizations and 2017 Museum Computer Network Scholar Award, granted for developing innovative solutions to enhance museum transparency and strengthen proactive management in global museum public relations. Evaluations with museum professionals through the web application launch in Melbourne, New York and online indicated that the project had a strong impact upon targeted audiences. They found that the Melbourne Engagement Power Layer and its application to track, assess and explore local museum audiences generated important new knowledge that will enhance the work of museums in the future. Intelligence on a museums soft power, discovered through the access to data and tools. ACMI officials indicated that the digital mapping system is a useful strategic development tool that will likely have strong cultural and economic impact on their work, on both local and international levels. Specifically, the application will be used to develop programming and audiences in Melbourne as well as to plan international touring exhibitions and identify targeted audiences across different countries.